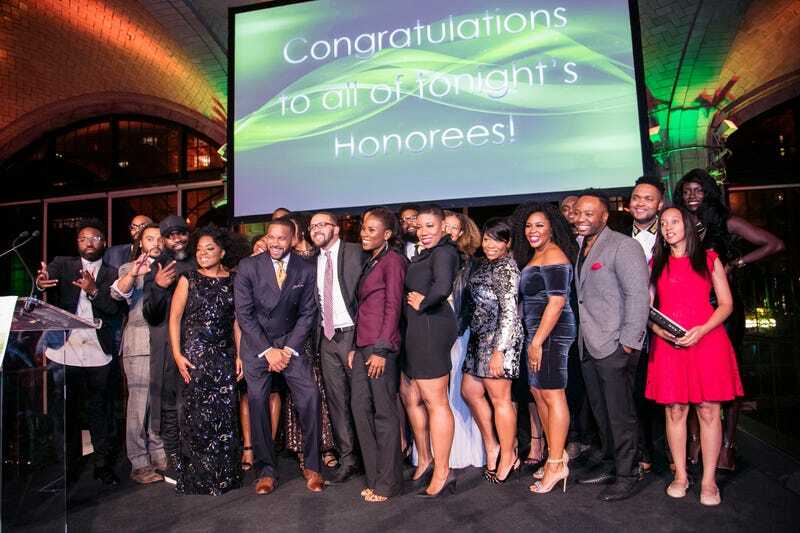 The Root celebrated the eighth year of The Root 100 list of influential African Americans, and the first gala with newly appointed Managing Editor Danielle Belton, on Monday in New York City at the swanky venue (that made every girl in the room want to host her wedding there) Guastavino's. And she’s right (duh)! The Root 100 is a celebration of the best and brightest black people championing their communities. And when you have Bomani Jones, the irreverent and prolific host of The Right Time on ESPN radio and co-host of ESPN's Highly Questionable, as the master of ceremonies, you’re in for a night of joy and no sleep (aka being woke). The Root’s publisher, Donna Byrd, opened the night by paying homage to one of the biggest black voices in media, Gwen Ifill, whom we lost Monday. The room sighed in sadness but delighted in having a chance to honor this legend in a room of excellence. Jones never holds his tongue, and neither do any of the esteemed honorees who graced us with their presence. That description couldn't have rung more true for honoree Luvvie Ajayi, a New York Times best-selling author (I'm Judging You) and all-around fearless pop culture pundit, who spoke during the event. The unfiltered scribe stood proudly onstage and went off-script to address the solemn times we're in since the election that made Donald Trump president-elect. "I blame white women," Ajayi boldly stated before a stunning room filled with laughter. She went on to speak about how voting played out by the numbers, and that it felt good to blame white women because history had done nothing but protect them. If everyone in the room wasn't in love with her before that speech, they most certainly tripped and fell into it afterward. "Continue being disrupters," Ajayi urged as she became emotional around Ifill's death. Other honorees who addressed the crowd were Adam Foss, former assistant district attorney in the Juvenile Division of Boston's Suffolk County District Attorney's Office and an advocate for juvenile-justice reform, and Symone Sanders, the former national press secretary for Bernie Sanders' presidential campaign and a CNN political commentator, both of whom roused the crowd with encouraging words around a damaging election and a weary America. While each speaker filled us up with food for thought, the actual dinner was nothing less than delectable. Guests received a three-course meal that rivaled their mama's best dishes. And after dinner, there was the after-party, filled with face painting, more cocktails and dancing the night away. Infiniti’s slogan is “Empower the drive,” and so the night was saturated in empowerment and inspiration. And just in case you couldn’t be there, here’s the ultimate gallery so that you can feel as if you were in the room. You’re welcome. The Root Chairman Henry Louis Gates Jr. The Root Publisher Donna Byrd and The Root Chairman Henry Louis Gates Jr. The Root 100 Honoree Haben Girma and Henry Louis Gates Jr.